Damage to one side of the brain can cause a lack of attention to the opposite side. Most common is an inattention or neglect to the left side of the body after an injury to the right side of the brain due to stroke or traumatic brain injury. The brain attends to the right side with both hemispheres but attends to the left side with only the right hemisphere. 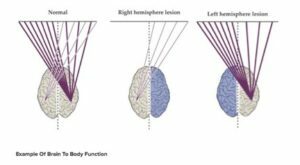 Therefore, when the right side of the brain sustains an injury, the ability to attend to the body and environment on the left may be diminished. 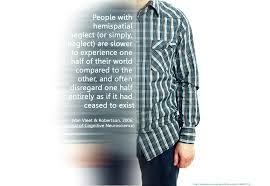 This is commonly referred to as left side neglect, unilateral neglect or hemispatial neglect. Studies report a wide range of patients – 13% to 80% (Barrett, 2006) — who suffered a stroke in the right side of the brain and are subsequently affected by left side neglect. Some examples of left side neglect include bumping into objects with the left side of the body, missing food that is placed on the left side of the plate, being unable to read a page in a magazine, or not responding to a person sitting to the left of the patient. This neglect can be frustrating to caregivers and loved ones. It is important to understand that the patient is not ignoring people or items on purpose; the inattention is a result of the damage to the brain. It may appear as if the patient is blind to the left side, but left side neglect is not a true visual deficit. The brain simply doesn’t have the ability to process information. Left side neglect may go beyond visual inattention to the left and also include inattention to sounds and touch on the left-hand side. It can also present many safety issues. Patients may not realize their left arm is wedged between them and the wheelchair. A patient may not see or recognize oncoming traffic on the left side or place their extremity too close to a hot stove top, and then often not realizing the injury until later. Professional treatment by a skilled therapist can assist with safety concerns as well as addressing the actual deficits. Another treatment technique is limb activation. This technique focuses on activating and engaging the left extremity in the space that is neglected in order to activate the brain’s spatial and motor control centers. Sensory stimulation is often used by clinicians through application of various textures to the limb or using devices as the SaeboStim Micro for electrical stimulation. Prism glasses can help to pull items from the left into a more central visual space. Mental imagery and virtual reality are new promising treatment techniques as well. Left side neglect can be mild, moderate or severe. Whether it is permanent or a temporary symptom, there are many specialized therapies that can address it. Dorothee Zuleger, MOT, OTR/L, ATRIC and founder of The Neuro Hub is a skilled occupational therapist in Central Florida. A graduate of the prestigious Adventist University of Health Sciences, Dorothee provides her passion and 7 years of experience in neurological rehabilitation through a client-centered, evidence-based treatment approach. Dorothee is certified by the National Board for Certification in Occupational Therapy, licensed by the Florida Department of Health, and is a certified Neuro-IFRAH®, Saebo, Aquatics Therapy and Rehabilitation Institute, and BBTW clinician.